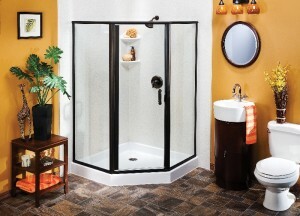 U.S. Patio Systems and Home Remodeling offers a wide variety of high-quality shower systems for you to choose from for your Minneapolis, Minnesota, area home. In fact, with our help, you can upgrade your old, out-of-date shower with a brand new one that’s outfitted top to bottom with custom features and accessories. The shower systems we install are sleek, modern, and easy to clean, and afford our customers the opportunity to raise their standard of living. Whatever your budget or remodeling needs when replacing a shower, you can rely on the team at U.S. Patio Systems and Home Remodeling for a fast, effective, and affordable solution. Bathwraps – U.S. Patio Systems and Home Remodeling is an authorized Bathwraps dealer. As such, we will be able to provide you an attractive replacement shower that is made of durable, mold- and mildew-resistant acrylic. Showers from Bathwraps are available in a wide range of colors and styles, and can be further customized through the addition of soap dishes, safety grab bars, foot pedestals, bench seating, and other accessories. The Onyx Collection – Also an authorized dealer for The Onyx Collection, U.S. Patio Systems and Home Remodeling proudly offers the full line of Onyx shower systems. Specific products available from Onyx include shower bases (pans), wall surrounds, shower doors, wheelchair-accessible showers, and more. If you’d like more information about our excellent selection of shower systems, please contact us today. Any one of our outstanding replacement showers – whether from Bathwraps or The Onyx Collection – is guaranteed to enhance your bathing area. U.S. Patio Systems and Home Remodeling is a leisure space specialization company serving Minneapolis, MN, and the surrounding area.